Did you know the World Othello Championship is taking place for the first time in history THIS WEEK at the University of Cambridge and the World Champion will be crowned on Saturday 31st October! I have to admit I’ve never played Othello before today and I have no idea why, because it’s a brilliant game. My 8 year old picked it up very quickly, the fast pace and constant changing of the person in the lead kept us both engaged till the very end. The idea is simple, one player has black dics and the other white, you sandwich the other players colour between your pieces and then flip their pieces to your colour. 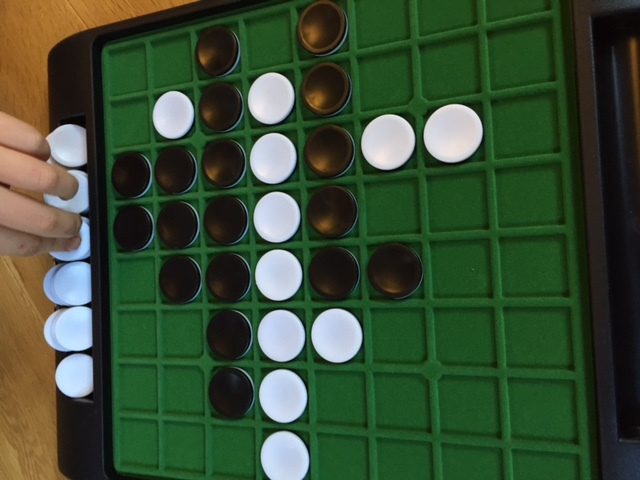 Zak and I love a good strategy game so Othello is perfect for us and also great for playing with friends, parents and grandparents too. This is the junior version of the hit Linkee game. Linkee isn’t something we’ve played before either, but my children absolutely love this version, we’ve been playing all half term. To play each player answers four questions and then has to work out what links the answers to win the card. Each card has a letter on the back and players have to win enough cards to spell DINKEE to win. 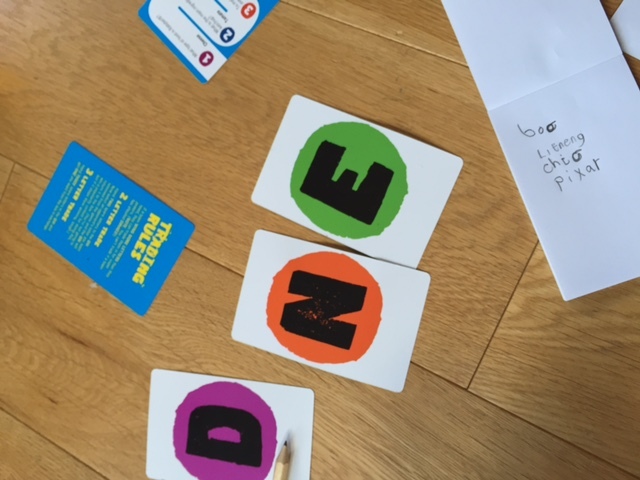 While the box states Dinkee is suitable for ages 8+ my 5 and 7 year old picked it up quickly and have enjoyed playing just as much as my 8 year old. For the little ones it’s been fantastic reading and writing practice as they read the questions to each other and write down the four answers so they remember them when working out the link. It’s also great for working out gaps in children’s general knowledge, I was very surprised for example that my 8 year old didn’t know the name of Prince Williams brother. We’ve laughed a lot playing DINKEE, my favourite so far is. We haven’t got around to playing Tipping Point yet, but I’m pretty sure we’re going to love it. 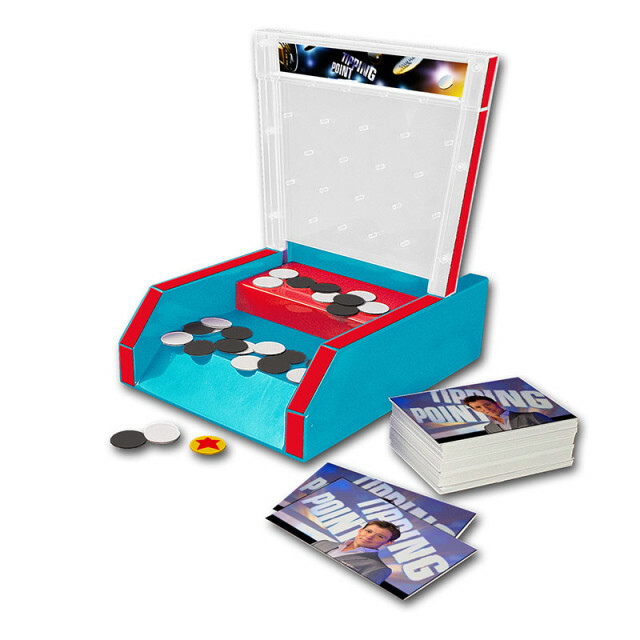 Tipping Point is based on the popular daytime ITV quiz show hosted by Good Morning Britain’s Ben Shephard, the game comes complete with electronic Tipping Point machine with moving base plate, as well as question cards and counters. The aim of the game is for players/teams to answer as many general knowledge questions correctly as they can. If players answer incorrectly, they risk being eliminated from the game! The winning team with the most counters goes on to compete in the end game to try to win the jackpot counter! These are great games. Our favourite has to be Monopoly and we have so many versions I have lost count. We even have a Nintendo edition in French!